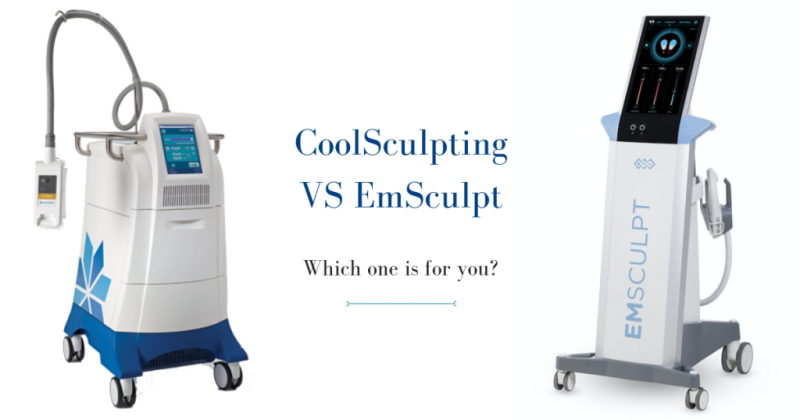 How do I know which is right for me – Emsculpt or CoolSculpt? If you’re trying to decide between CoolSculpting and Emsculpt, we recommend booking a complimentary consultation with one of our experienced medical providers. We will help guide you to make the correct decision for your goals. Combining both technologies may very well provide your best aesthetic outcome. We encourage choosing an experienced medical provider you know you can trust. Emsculpt works by using an FDA cleared high-intensity focused electromagnetic (HIFEM) energy. This energy activates the nerve and muscle fibers burning fat and building muscle mass at the same time. Physically we can only activate roughly 40% of a muscle on our own working out – Emsclpt technology will activate 90-100% of the muscle. Emsculpt gives our bodies the ability to achieve what we can’t achieve on our own. Final Emsculpt results are equivalent to 6 months worth of working out in 2 weeks. Like CoolSculpting, you can treat many areas on of the body with Emsculpt. An experienced medical provider, like Injector 5280, can help you to achieve your best results. CoolSculpting works by using a patented and FDA cleared cooling technology to freeze unwanted stubborn fat in the stomach, thighs, arms, chin, and more. As we like to say, if you can pinch it, we can freeze it! As a result of this controlled and targeted cooling process, the fat cells are destroyed and eliminated from the body through natural processes over the next several weeks. Which is Best for Me – Emsculpt or Coolsculpting? We always recommend booking a complimentary consultation with a qualified medical practitioner prior to making a decision. Identifying your concerns and goals, along with understanding your anatomy, will enable us to offer you the best treatment plan. With that said – CoolSculpting may be the best option to isolate and reduce larger pockets of fat in various parts of the body. After larger pockets of fat are reduced, then Emsculpt may be recommended to tighten and build muscle in the treatment area. We are even able to treat the surrounding areas with Emsculpt to help deliver the best aesthetic outcome. On the other hand, if your mostly interested in building muscle tone and adding definition, only Emsculpt can offer both of these benefits. If you want a booty lift then Emsculpt is the answer. The technology provides unparalleled toning, firming and lifting of the buttocks. If you are concerned about diastasis recti following a pregnancy, or even an injury no matter how long ago it was, Emsculpt is your best proven nonsurgical option. At our medical practice, Injector 5280 in Denver, Colorado we are excited to be able to offer both of these body sculpting options. We are proven body sculpting experts. We are experienced in proving the best treatment plan to help you achieve your goals!